Voluntary aid Detachments, VADs, or even Very Adorable Darlings as they were sometimes called, were generally young women with very little work experience. They were trained in First Aid and what was called Home Care, and were often from upper class families. Sometimes they were local women, the wives of farmers or soldiers. At the beginning of the war the VADs worked at auxiliary hospitals where the atmosphere was relaxed and conducive to rehabilitation and recovery. 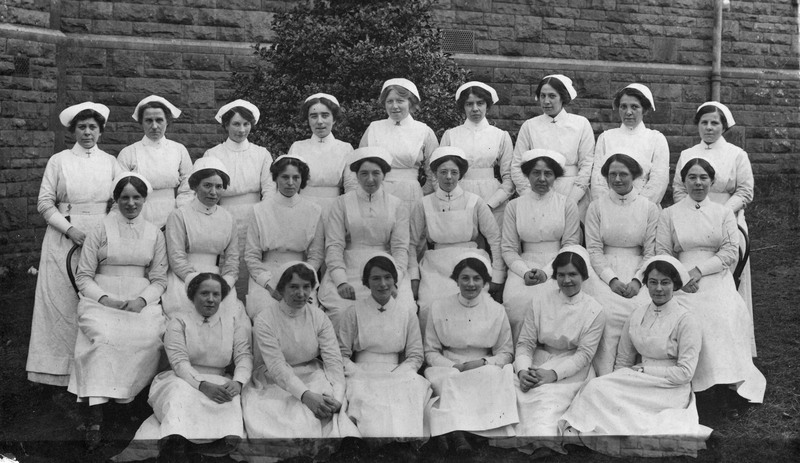 However by 1915 the need for nurses was so great that VADs worked alongside trained nurses from the Queen Alexandra’s Imperial Military Nursing Service. 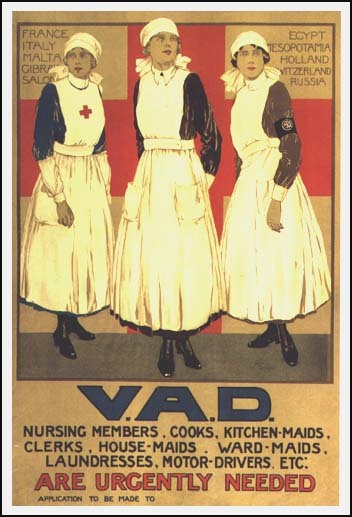 Over 90,000 women served as VADs during the war at home and abroad. Came from South Devon, worked as a VAD and a masseur. Her details record that she worked at Beaufort; Orthopaedic section from June 1918 – April 1919, then she was transferred to Southmead. Came from Shrewsbury. She registered as a VAD in August 1917 and worked at Beaufort until the hospital closed at the end of February 1919. Came from Cotham in Bristol. She is listed as a Nursing Sister and worked at Beaufort and Bruce Cole. Came from Stoke Bishop in Bristol, and is registered as a Masseuse. She started work in November 1917 at £1 7s 6d a week. When Beaufort closed in February 1919 she had risen to the rank of Senior Masseuse. She worked part time, three and a half hours a day; her particular duties were massage and electrical therapies. Interestingly, her record also tells us that she had 9 months massage training in 1916; and a further fortnights training in Electrical Treatments (Medical Electricity).